An important look at how America has won its wars in the past and how it can continue winning in the future. Is there a recipe for military success? 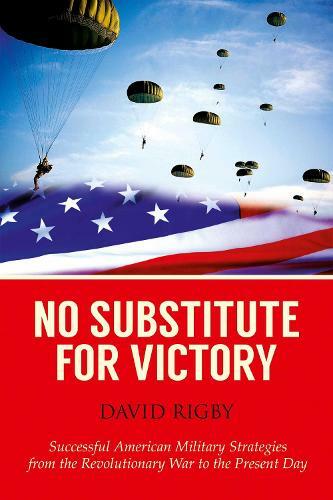 In No Substitute for Victory, author David Rigby grapples with this issue and determines that, in the case of the United States, there are a number of different strategies that have brought victory in battle to American forces over the years. In a clear, energetic prose, Rigby explains how the dropping of chocolate bars from airplanes over Berlin turned out to be one of the most successful applications of the Cold War strategy of containment. He argues, too, that far from being a radical change in policy by a desperate President Lincoln, the Emancipation Proclamation was in fact an essential part of Lincoln's plan to reunite the nation. While the focus in No Substitute for Victory is on military maneuvers that have been successful, Rigby brilliantly uses the Vietnam War as a touchstone for comparison purposes on how not to fight a war. While the writing of military strategy is a crowded field, Rigby's approach is unique in that he draws examples from conflicts throughout American history, from the Revolution up through the modern day. Rigby's ability to find similarities in and to draw conclusions from the successes attained by American forces in battles as seemingly dissimilar as Gettysburg and Midway makes No Substitute for Victory essential reading for anyone interested in the riveting history of our nation's military.